Foods high in fat, such as oils and nuts, often get a bad rap. Some fats, however, have numerous health properties and may provide several benefits. One such fat is macadamia nut oil. This gem may not currently grace your kitchen cupboards, but it could be well worth including in your diet on a regular basis. Olive oil is well-known for its high content of heart-healthy monounsaturated fats, but macadamia nut oil fares even better, weighing in at 85 percent monounsaturated. It also contains a high amount of oleic acid, a particular type of monounsaturated fat that can lower your triglyceride levels, writes nutritionist Dr. Jonny Bowden in "The 150 Healthiest Foods on Earth." The ratio of essential fatty acids in macadamia nut oil is perfectly balanced, according to sports nutritionist Ben Greenfield. Ideally, you want a roughly even amount of omega-3 to omega-6 fats, claims Greenfield. Macadamia oil has this ratio. Your body can't make either of these, hence you need to get them through your diet, but too many omega-6s and not enough omega-3s can increase your risk of arthritis, cancer and cardiovascular disease. 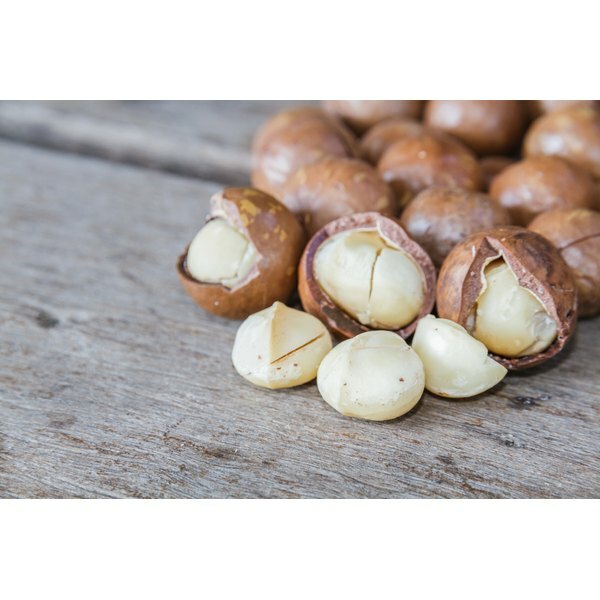 Two sometimes overlooked benefits of macadamia nut oil are its smoke point and stability. Due to its low polyunsaturated fat content, it can be kept for several years and has a high smoke point, making it good for cooking at higher heats. Cook using an oil with a low smoke point and you risk denaturing the fat, essentially turning it from a "good" into a "bad" fat. It doesn't need to be refrigerated but should be kept in a cool, dark place. Aside from the potential health benefits, one of the best selling points for macadamia nut oil is its taste. With a nutty, slightly sweet taste, it makes a good addition to healthy baked goods, such as low-sugar brownies. Try scrambling eggs with macadamia oil and cinnamon, or adding it to a chicken and cashew stir-fry. The Heart and Stroke Foundation South Africa: Nutty About...Nut Oils?